Nerveless construction workers are “walking iron” on a New York skyscraper in the early years of the 20th century. Along with thousands of his countrymen, Jussi Ketola moves from Finland to the United States in 1907. 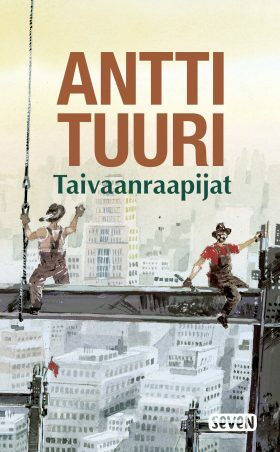 In New York City he joins a group of Finnish men working on the construction of what was at the time the world’s tallest building, the 213 metre Met Life Tower on Madison Avenue. The safety measures for workers are minimal and many accidents happen. At the beginning of the last century, there were as many as 20,000 people of Finnish origin living in Brooklyn and Harlem. These men are prepared to go anywhere for a chance to earn a living. Even if it means their office is a steel beam more than 200 metres above the street level. Alongside them work fearless Mohawk Native Americans, who are equally comfortable with the dangerous task of “walking iron”. I went ‘skywalking’ for less than three hours. The book gave me entry to another world from which I only reluctantly came back. Now, I find myself almost crying with self-pity for having turned the last page. I do not want Skywalkers to end. I do not want my reading to end.